A Dog Named Cat . . .Ellington? Hmmm . . .
Hello Again, My Dearest Guys And Gals. Y'all Livin' Your Lives To The Fullest? That's A Good Thing, Babies. Keep Right On Doin' It. According To One Prominent Website, Naming Your Newborn Puppy - Or Even An Older Pooch - After Some Famous People Born On November 28th Would Be Quite A Groovy Thing. Let's See . . .One Could Choose To Name His Or Her Pooch After Say, R&B Cutie Trey Songz Or Another Cutie, Being He NHL Star Goalie Marc-Andre Fleury Or The Hilarious Michael Blackson Or Jon Stewart Or Hope Lange Or Berry Gordy Or Even Yours Truly, Me, Cat Ellington. Hey, The Choice Is Completely Up To The Pooch Owners. And Speaking, Via This Post, Of The Canine Kind, I Just Returned Back To The Land of 10,000 Lakes Fom Maple Leaf Country Last Night - Sick As One Of Them. Y'all, I. Was. Sick. As. A. Dog Over The Past Two Days. Whew! It Was Rough. But Thank God For NyQuil And Good Old-Fashioned Hot Soup. Ooh . . .That Was A Miserable Bug. My Kiddens And I Were All Under The Weather. But We're All Feelin' Much Better Today. Still Some Coughing And Sneezing, But We're Approaching Well. Okay. Back To The Reason For This Amusing Post. Hey, I Thought The Pooch Site (idognames.com) Was Really Fun - I Saw It For The First Time Earlier Today. Gon' And Check It Out, Why Don't Y'all. Ed Harris And Anna Nicole Smith Are On The List Too. 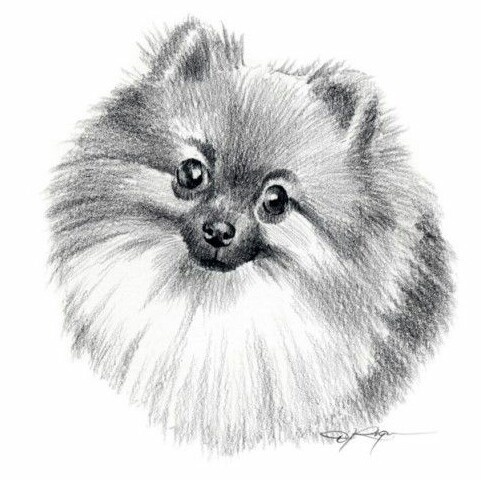 Pomeranian Pencil Drawing Art By k9 Art Gallery and KC Dennee Is Featured Courtesy Of The Black Jaguar Music Company. This Particular Artwork Was Chosen By Me That It Would Serve As A Playful Tribute To My Own Beloved And Waaay Too Groovy Pomeranian, Aspen.